Wilson Mather-GlassMs. RomaniukReading l.A. Book Review 318 October 2010Wrecked:Drama Without Reason	If tragedy struck in your life, would you whine about it for eternity, or try to get past it? Wrecked, written by E.R. Frank is a slow, melodramatic realistic fiction novel. Anna is a girl whose life is shaped after a traumatic accident. She and her friend Ellen barely survive the crash that takes place in front of Wayne’s house, after leaving a party. However, the other driver wasn’t so lucky. The accident continues to haunt Anna forever, because the other driver was no other then her brother’s girlfriend, Cameron. Anna whines about “how hard her life is” the whole book, to the point where you wish that she was the one that didn’t survive the crash. I would give this book a whopping one star! Wrecked is an unpleasant book because the characters are irritating, the book finds a way to be dramatic without being enthralling, and the book is filled with flashbacks that barely connect to the story.Wrecked is an unpleasant read because the characters (especially Anna), are quite irritating. As you might’ve guessed, it’s not very interesting listening to a character moan about her problems over and over again. It seems like everyone in the book had moved past Cameron’s death except for Anna. Anna tries to bring up the accident about two-thirds through the read. Jack simply states, “Anna you’re honestly the only who still hasn’t moved past her death.” And it’s true. It seems like almost every character had gotten over Cameron’s death, except for her. Another way that Wrecked is an unpleasant read is that it somehow finds a way to be dramatic, without being enthralling. If you haven’t gotten the hint by now, Anna is a very dramatic character. If dramatic isn’t over-exaggerating how hard your life is, I don’t know what is. When asked what is wrong, because it is very clear that something is, Anna always resolves to, “Everything”, even if it is many months past the actual accident and her life is fine. These are the parts in the book where you are inclined to roll your eyes or even abandon the book. One more thing that I couldn’t stand about the book was the countless number of irrelevant flashbacks. At different points in the book, Anna would flashback to something that happened involving her and her brother from earlier years. When Anna’s family goes on a trip to the ocean, Anna asks her brother if there are any riptides. She then has a flashback to a time where they went in the water and her dad almost drowned because of the riptides. This seven page side note left me very confused, for it did not relate to the story in any way. So, as you can see, Wrecked is an unpleasant book because the characters are irritating, the book finds a way to be dramatic without being enthralling, and the book is filled with flashbacks that barely connect to the story. My only example in this my life that somehow relates to this book, is that I know people who talk about how hard their life is, even though they have it easy. This book reminds of a crappy pop song where a singer might sing about her hard life, living in Hollywood in a multi-million dollar house. Seriously, that’s how dramatic this book is. I learned from this book that when the back cover starts out by saying, “In the latest dramatic work…” I probably won’t like it. The night that continues to haunt Anna begins with a party at a friend's house. After her friend Ellen gets inebriated, Anna gets behind the wheel. A series of events lead up to a collision that injures Ellen and kills the other driver - who just happens to be the girlfriend of Anna's brother. Anna continues to hear Cameron's screams...but what affects her the most is when the screaming stops. In addition to this, she suffers from nightmares and panic attacks. Unfortunately, her father is in complete denial and believes that his daughter is perfectly fine. At last, her parents see her break down and decide to allow her to go to counseling. This book portrays the emotional effects of the choices we make, and the parts of life that are out of our control. This really wasn't my favorite book. I was expecting it to be a lot better than it turned out to be, and it was pretty repetitive. The story never really went anywhere after the accident, and I grew tired of reading the same thing over, and over, and over. The fact that the author brought up different memories from when the protagonist was a kid did nothing except for distract the reader from the present, and I felt like they didn't really tie into the story at all. I never really grew to like Anna, and I didn't have a favorite character. There were some parts where I would like a character, but then something would happen later on to make me not like them anymore. Overall, definetly not my favorite book. I really enjoyed reading this book. I picked it up at a library sale for a dollar because I liked the cover. I am really glad I bought it. This book was great. The story was amazing. I have never read a book about a car accident before. The charters are unforgettable. They are also relatable. I found myself finding something about every character I could relate to. I highly recommend this book if you are looking for a short read with a great story. I will be rereading this book in the future. This book is definitely for someone who likes a good action book. The beginning of this book automatically pulled me in from the drama, mystery, and results of accidents. The characters can be very relatable and typically that's what most people like while reading a book. E.R. Frank is an amazing book writer and i look forward to reading more of her books. If you like intriguing incidents that captivate your attention, here is a book for you. Grade: C-After drinking at a party, Anna drives home with her drunk best friend Ellen in the passenger seat. Another car, with her brother in the passenger seat and his drunk (but otherwise perfect) girlfriend driving. Cameron does not survive. Ellen is badly injured. Jack, Ellen and Anna experience varying degrees of PTSD. At home, Anna's father, who has a history of OCD and rage seems to be falling apart.Positives:-An accurate description of PTSD and EMDR, though perhaps a bit over explaining the EMDR angle as well as the eye injury specifics and tests. None of this added to the story, but it did slow down the pace.-ER Frank created a realistic, dysfunctional family.Things that bothered me:-Drinking and driving was barely addressed. Other than the accident, there were no legal consequences for having drinking and driving and not even a stern lecture from parents. Anna did have alcohol in her blood and Cameron was drunk. ER Frank, a psychologist who uses EMDR, the treatment Anna had, in her practice, seemed to ignore this part of the story in favor of concentrating on the PTSD aspect of the aftermath of the accident. -I didn't feel attached to Anna or the story. The writing lacked a certain emotional connection. I should have picked up on some of Anna's feelings, but I never did.-Failure to address the father's OCD tyranny and rage episodes as emotionally abusive or the mother's lack of assertiveness in making headway with him. Frank should have toned him down, or named his treatment of his children as a use-The ending felt flat, like a shrug instead of a period, question or exclamation mark.BOTTOM LINE: WRECKED is a slow paced story of a teenager dealing with PTSD after an accident. Teens with PTSD will probably appreciate the story, and I'd recommend it to clients suffering from trauma. I wouldn't recommend WRECKED to other clients, but I wouldn't dissuade them from reading the book either. 1. Wrecked2. E.R. Frank3. Fiction4. This book is about an ordinary girl hiding behind the shadows of her popular well-known brother. She had always been the one no one really notice until one night of drinking and driving where she killed her brothers girlfriend Cameron. The whole town and her parents convince people that she didn't kill her when she knows herself that she did. She now lives her life with flashbacks of the accident and the griefs of her family members.5. One of the key motifs is grief because throughout the book she still gets flashbacks of what she did and regrets it. She still cant get passed the fact that she killed Cameron. Another motif is lack of self confidence because ever since the accident she questions herself and her life.6. Grief-“Mostly you realize you can handle it. You’d rather turn it upside down and dump it out…You’d rather do that, because you don’t want to have to handle it…But you do handle it. Because the thing you learn is that you can.” page 175. Poor self confidence- ""Cowards can be judged only from an unbiased point of view" page 1947. Quote one helped me understand this theme because it goes deep into the meaning of grief when she says, "You’d rather turn it upside down and dump it out…You’d rather do that, because you don’t want to have to handle it…But you do handle it" Quote two explains how she is always insecure of being judge which shows her lack of self confidence.8. I believe 65% of the population might enjoy this book because of the difficult courses she faces throughout this book that other people can relate to with grief, self confidence, regret, disgrace. "Wrecked" is about Anna, who unfortunately gets in a car accident with her best friend after a night of fun and drinking. She and her friend Ellen survive while her brother's boyfriend Cameron gets killed. After the incident Anna is suffering from panic attacks, nightmares, has a problem with her right eye, and can't even get close to her car. Her friend Ellen broke her leg and a few of her ribs. While the car accident barely left a physical mark on Anna, it did a whole lot of mental damage to her, and this book is about her recovering from being the "other" driver.This was a good book. Not horrible, not great. The story was good and the central message was important, but the author seemed to get distracted from the main plot and even ramble a bit. The characters were okay - a few I related with, most of them I didn't really care for. Overall I would only reccomend this book to people who are heavily interested about people who go through Post Traumatic Stress Disorder. I expected better from this book. Great storyline, Anna is driving the car that severely injures her best friend and kills another young girl, coincidentally her brothers girlfriend. Although it was not her fault, this story is her journey of how Anna comes to terms with the accident and all that involves. This was not a can't put the book down type of book. It was an effort to finish it. It's repetitive, jumps all over the place and quite frankly isn't that interesting. I was on the fence about this one for a couple of chapters but then the accident happened and I was hooked. It's been a while since I've read a "normal" book where there are no aliens, space travel, sword fights, angels, demons, etc. It was a nice change of pace. There were so many times that I wanted to slap Anna's father and ask him what was wrong with him, and her brother too. Anyway, I don't want to say too much, but this one was a good, quick read in-between series. Death at a young age affects everyone and even though the accident wasn't Anna's fault, people still assume it was still somehow her fault. This was a good book, it was not what i expected. It ended abruptly. Kind of like most things. Arggg.. If you are interested in the book just read the inside dust jacket. It will tell you everything with out the torture of actually reading the book. This book was just... so boring. I probably skimmed almost the entire last half of it. When I was looking for a book to read, I was not expecting to come across this one. Wrecked hooked me in just by reading the back cover to see what it was going to be about. It had a twist. I was not aware that Seth would be able to kill Anna. Even if it was an accident while they were driving. Who would have ever thought Anna was going to get killed by her boyfriends brother. A car accident that clearly did not end well. Seth, the boy would killed Anna was not handling the situaiton well, but honestly who would? Jack his older brother was devastated and it's understandable. The reason why I liked this book was becacuse there was a time where I was in Mexico and my older brother and cousin witnessed a horrible car accindent. They told us what had happened and reading this book gave me a flashback. Reading this also sends out a meesage to teenagers who drink at parties and get behide the wheel, or those who shouldn't be driving yet and still take the car. Accidents do happen more often due to wrong actions likes these. I enojoyed the overall message the book gave me, many readers may get a diffente message, but we all are different reads and we all have different points of views. I even recommended this book to my younger brother. CHARACTERS: I rate the characters a 5. All of the characters were very well described. Anna is the main character and she gets in a car accident which kills her brothers newfound love and puts her best friend into a coma. The story focuses on her emotions as well as everyone elses thoughts about the accident. Some of the characters are charismatic,sensitive, foolish, fearful, and so on. I loved the characters because they are so believable. A father is firm and tender hearted which defines Anna's dad. "How come he gets to make all the rules? How come everything has to be his way? "(Frank 167). This quote proves tough love and the roles of a parent. The characters do not stay true to themselves. Anna was pressured into driving to a party and drinking alcohol. Unfortunately this caused the car accident. The characters are different and relatable and that is part of what makes the story so amazing.SETTING: I rate the setting a 4. For the most part, the setting is important to the story. Anna, her family, and her friends live in a neighborhood near schools and stores. The story could have been taken place in another area but not in a different time. It has to be in the twenty-first century because they have vehicles like the Audi. The most significant part about the setting is when Anna has a flashback. "The first time Jack threw me out was the summer of the sharks. "(Frank 162). Her flashbacks are when her and her brother where kids and went to the beach. The author doesn't pass time quickly. After the car accident happens, everyone who is physically and mentally hurt have to heal and that takes time in real life. Ellen begins in a coma, has surgeries, goes home from the hospital,she has a wheelchair and cast, then the cast turns into a short cast, and eventually it is taken off. This makes the story more true. PLOT: I rate the plot a 5. The story was told in an unusual order. It jumps right into the main idea from the very beginning. "The day I killed my brother's girfriend started with me handpicking leaves off our front lawn"(Frank 1).Normally a book leads up to the the climax but this book started with the climax. It got a little confusing when Anna was talking about what was currently happening and then she switches to a flashback because it is very sudden. I did not predict the ending. I was hoping for something exciting to happen or an actual conclusion. Instead it ended in a casual way and I didn't really like it. "Wrecked" is about Anna, who gets in a car accident with her best friend after a night of partying,fun, and drinking. She and her friend,Ellen, survive while her brother's boyfriend Cameron gets killed. After the incident Anna is suffering from panic attacks, nightmares, and can't even get close to her car. In other words she has Post Traumatic Stress Disorder.Ellen broke her leg and a few of her ribs. The car accident may not of left very much physical damage, it did a whole lot of mental damage to her. This book focuses on her recovery from the accident.THEME: I rate the theme a 3. The authors main idea is about grief. Throughout the book Anna is having flashbacks of the car accident. She can't sleep or even drive because she feels so bad about what happened. She has nightmares that relate to the car accident but take place in California where her family vacations. "...and there's a tidal wave of salt water and blood about to destroy us, and there's screaming and screaming and screaming, and then the screaming stops"(Frank 109). The car accident replays in her head and she just can't get passed the fact that she killed Cameron. A lot of people have grief and that makes this book very relatable. The title "Wrecked" is reffering to the car accident and her emotional being. Which gets destroyed because of he grief she has.PERSONAL RESPONSE: I really like this book. It is very real and touching. As I was reading it, my eyes would get blurry but I couldn't put it down. I needed to know what happens next because it is so interesting. I would recomment this book to anybody! This book makes me more careful because you can change your life or somebody else's life in a split second. "Wrecked" is a novel by E.R. Frank about a teenage girl named Anna who gets in a car accident that has major impact on her life. The story starts with Anna going to a party with her best friend Ellen. When Ellen gets drunk, Anna drives them home, and while driving they get in a car crash and kill Anna’s brother Jack’s girlfriend, Cameron Polk. Anna escapes the accident with minor physical injuries, while Ellen ends up being unresponsive for a while due to brain damage, and a broken leg. Although Anna avoids physical injuries, she faces the pain of having to face her family and friends, and the lasting horrors of her PTSD. Anna often is haunted in memories of the crash through her dreams, in which she usually ends up recalling details of the crash, and wakes up screaming, “I’m on Ocean Road and there’s a glass ponytail slicing into my eye, and there’s earth dangling above me in the dark sky, and there’s screaming and screaming...and there’s a tidal wave of salt water and blood about to destroy us, and there’s screaming and screaming and screaming, and then the screaming stops”(109).My favorite character was probably Anna, because she was the character the reader got to know the best. Although, Anna was a difficult character to understand at times, because of her PTSD. After the accident, Anna was so withdrawn from the rest of the world, and it really showed repercussions of herr actions. Anna ended up having to go to therapy to try and get over her PTSD, and deal with the lasting effects on her life. The effects of the car crash made Anna terrified to drive again, and when she tried, she had extreme anxiety attacks, “That’s how long it takes before I lose it. Chest leaping, body shuddering, sweating like I’m running a marathon...I manage to weave the Audi over to the side of the road and pull out my cell phone. I call 911”(101). I think the reader builds a sympathetic relationship for Anna, because of her extreme character shift from before the accident throughout the book. I think that E.R. Frank intended on this relationship, and intended on making the relationship a personal one. Anna’s relationship with her brother struggles throughout the book also, and the reader engages on seeing that they can repair their relationship.Overall, I think that this book had a strong message of the author’s views on teen alcohol, drinking and driving, but an overall message that every action has it’s consequence. This theme was portrayed throughout the entire book starting with Anna and Ellen’s decision to get drunk at a party, and Anna’s decision to drive home intoxicated. I think Anna definitely had very tough repercussions to follow her decision, but it also showed how serious trauma like a fatal car crash can cause. I wasn’t much of a fan of this book, because I found the book to be boring at most points. I understand the wide meaning of the book was that the crash “wrecked” her life, but I did not think that the parts after the crash were interesting. However, I believe that Anna’s behavior after the crash are most likely extremely accurate. I would not recommend this book to many people, because I lost interest very quickly, and had a hard time engaging myself in the book. Joan AybarNovember 17, 2014 WreckedE.R. FrankWhat would you do if you accidentally killed someone you cared about? It was an ordinary night when Anna - the main character - and Ellen were extremely anxious to go to a party, waiting for long hours for the moment to arrive. After departing from the party completely drunk and unconscious, Anna and Ellen suffer from a car accident. Anna wakes up at the hospital screaming terrified. She noticed that her parents are in the room but she couldn’t identify Ellen. Her parents calm her down and told her what happened in the accident; she is informed that the person in the other car was dead and was recognized as her brother’s girlfriend, Cameron. The accident continues to haunt Anna. Through this whole book it demonstrates Anna’s life, how demanding it becomes, and all the difficulties and desperation she gains while being at her house – unwanted by her brother – and she wasn’t able to focus with her school work. What happened to Ellen? Will she get through this misery and pain?I personally don’t like much the realistic fiction genre, but in my opinion this book made me notice that they‘re really entertaining and enjoyable to read. E. R. Frank always offers great details and effortless vocabulary, meaning that its vocabulary is really easy to get through and understand. This book offers lot of character description and you really get to know the characters. It has a really powerful message that explains that you need to be strong and patient when you’re trying to heal from this kind of catastrophe like the one the main character is experiencing, because this is the only way to get through it so that you don’t get sucked into torment and agony were you won’t be able to go on with your life. I really loved this book, and I think this is an excellent book for starters who would like to experience this type of genre.I would recommend it to the people who like reading about realistic fiction involved with some sort of drama within the character. I would also recommend this to the people who like connecting to the characters, because you get to know how they feel and how they act upon certain things. Lastly I would recommend this to the people who love reading about tragedy and awful events – like death and car accidents - that could affect the character’s life. I wouldn’t recommend it to the people who like action involved because you don’t get to see much of it in the book. Wrecked By E.R. FrankAnna has a best friend just like everybody else, she has Ellen. They sit together, talk together, laugh together, and killed Cameron Pollock together. The accident that wrecked Cameron’s, Jack’s, Ellen’s, Anna’s and anybody close to Cameron’s lives, started with a party. Anna never liked the taste of alcohol, but Ellen did, Ellen got drunk and Anna was buzzed, when they tried to drive home they collided with an oncoming car, killing the driver Cameron Pollock. Now Cameron is more than just a girl who goes to their school. Cameron is Anna’s older brother Jack’s girlfriend of almost a year. Anna got out of the accident with a punctured eye, Ellen has a collapsed lung, broken ribs and a broken leg. Ellen is hospitalized for as long as she needs to be, but Anna is stuck going to school, seeing her brother and dealing with the pain of everyday life. Her brother Jack began to hate her, all of their years of building a relationship broke in a single second, the second Cameron would never wake up. Anna was blamed for the accident, for putting her brother into depression. She has anxiety attacks when she thinks of driving, she has to deal with Seth, her half boyfriend. They’re not official because Anna doesn’t want to be responsible for someone else’s happiness when she’s struggling to find her own. She hears her brother crying through the wall every night, trying to cope with the fact the he lost the love of his life. Anna has constant night mares of the accident, old memories and future problems; she doesn’t know how to cope. Throughout the book Anna tries to learn to cope with the accident, begin to drive again, fix her relationship with her brother and to become happy once again with the help of her therapist, brother and close friends.I personally really loved this book. Its very well written, and the plot is very interesting and not something that I normally read about. It mostly keeps you excited and ‘not wanting to put the book down. ‘But the language is a little raw, and at times the author is lacking details. The book gets slightly confusing when they go into flashbacks and your not quite sure whether that part is new or old. The author always finds a way to make the main idea stand strong throughout the whole book, there is almost never a dull moment. It gives you a really good feeling of what a 16 year old alcoholic teenager could be going through when their overwhelmingly sad, and longing for closeness with her parents and brother once again. "'Anna, listen to me,' she says...The driver of the other car died. ''I know,' I tell her, but my jaw and mouth are chattering so much, I can't make the words. 'Anna,' my mother says. She pulls her arms even tighter, and I'm glad because I think I might shake myself right off the bed onto the floor if she weren't here, holding me together. 'It was Cameron Polk,' she says. "Anna and Ellen just wanted to go to the party and have fun. But a night that starts with them drinking and partying results in an eye injury, a broken leg, a collapsed lung, broken ribs, and, most importantly, the death of Cameron Polk, the girlfriend of Anna's brother. Anna cannot shake off the guilt that follows her around like a lost puppy despite the fact that the cops, her parents, and everyone else tells her that the car accident was not Anna's fault. Plagued with "heart attacks," nightmares, and a new fear of driving, Anna is trying to convince herself that everything will be okay, but reality hits when Anna hears her brother crying in his room every night since the death of Cameron Polk. Because she knows that she was the driver of the other car that killed her.Ultimately this book was okay. I did not get as into it as I had anticipated. The book started out really good. It had such a great start that I had problems putting the book down. However, the ending was not all it was cracked up to be -- in other words, the ending was not what I had anticipated, but in a bad way. The characters also did not intrigue me. There was nothing "special" that made each character stick out, and I felt that each character, especially Anna, could have used that. However, the book had one great quality. The aftershock of getting into a car accident where the other driver dies was pretty accurate. I was researching some of the common characteristics of those who suffer this type of situation, and I found that the author did a wonderful job portraying them.I do not think this is a book that I could teach to a whole class. There were not many themes or metaphors that I found throughout the book. I also found problems with some of the content issues, such as alcohol and sexuality. These may cause concerns for parents. However, I do not discourage recommending it to a student who may have suffered similar circumstances. If this happens to be the case, I would recommend providing it to a high school audience. Some of the issues brought up in the book may not be suitable to middle schoolers. In a small town where everyone konws eachother's buisness; the protagonist of the story, Anna, is picking leaves in her garden during a sun set. When the fight falls, Anna wants to go to her bestfriend's house, Ellen, because of the party happening that night. Her father wants her to continue handpicking the leaves until the garage looks fine. Without listening to her father's restrictions Anna takes her car out and drives to Ellen's. Ellen explains to Anna that she shouldn't get drunk since Ellen wants to drink and one of them has to drive home. Anna follows her bestfriend's advise to not get drunk. When Anna is driving home, they get into an accident because the car going the opposite way had to avoid a tree branch which meant the driver of that car had to go on Anna's path.After the incident Anna wakes up in a hospital with her mother beside her. After learning that the driver of the other car died Anna gets speechless and immediately feels guilty even though it wasn't her falt. Anna then learns that the person that died in the car accident was no one then Cameron, her brother's girlfriend. The nurse informs Anna about her eye injury which meant that she will have to wear a shield on her eye for 2 months.When Anna goes out her hospital room she immediately wants to see if her bestfriend is okay. Unfortunitaly Ellen has a brain damage and a broken leg and she has to stay in a coma for 3 weeks. When Anna arrives home she gets into a closer relationship with both of her parents however the brother and sister relationship with her big brother Jack becaumes wierd. Sometimes thoughout the night Anna hears Jack crying in his room and she starts to feel guilty again. When Ellen wakes up, they two bestfriends continue to get along perfectly. This novel ends in a dramatic way because Anna has to deal with PTSD (Post Traumatic Stress disorder) but she has her family and her bestfriends to help her deal with it. Wrecked was written by E.R. Frank because he wanted to comunicate a message with young adu lts, and there are several lessons that could be tought from this novel . I would recommend this book to 7th graders because of the lexile level and the vocabulary used. I would also apreciate recomending this book to both genders but epecially girls since the narrator was Anna and the author of the book is a woman too. This book would fit people that don't like stories that have happy endings because this book ended a little dramaticaly. When I first looked into this book, I didn’t think there would be much special about it - after all, how intriguing can a book about a car accident be? I am pleased to say that I was proved wrong! (Albeit, slightly)This book is about a sixteen year old girl, named Anna, who is involved in a car accident that kills her brother’s girlfriend. Her best friend is also involved in the wreck and she is injured very badly. Anna comes out of the wreck, remotely, unscathed and after a short stay at the hospital, she is back on her feet again. However, just because the physical injuries are not there, the mental ones are there to stay. Right off the bat, she is overcome with guilt as well as suffers from PTSD due to the crash. One thing I really liked about this book how the author dealt with PTSD and therapy; they showed many different viewpoints and reactions to going to see a therapist, as well as showing how PTSD can effect everyone differently. I also really liked the animosity between Anna and her brother, but I wish it would have been developed more. The same goes for Anna’s relationship with her parents - I wish that would have been developed more as well. The relationships in this story were presented as vague and ambiguous for the most part, and I just wish there would have been more to them. However, I really enjoyed reading about how Anna tried so hard to get back on her feet. I could relate to her in a sense because for so long she did not want to believe anything was wrong with her or that she should not feel the way she did because she suffered the least injuries from the wreck. It was nice to see Anna learn how to cope and forgive, and the book had a very nice message overall, and on the last page. I finished reading this book in less than two days.My rating is due to the fact that while this book was a good read - it was simple, quick, easy, but also interesting and something about it kept me reading it - it wasn’t entirely memorable. There was a lot that I wish would have been expanded on and it did not leave me feeling any type of way once I finished, but I still enjoyed reading it nonetheless. Wrecked is a story that deals with loss, guilt and healing. It centers on Anna as well as her friends and family as they all try to cope due to one situation or another that has impacted them. There are many different elements in this book that don't just revolve around the accident but mostly, it's about the underlying guilt that Anna feels following Cameron's death and the events that unravel as she tries to live her life with the recollection of that one night gone wrong.I have never read anything by E.R. Frank before but after reading Wrecked I would most definitely pick up another one of her novels. I really enjoyed the way Wrecked was written in a fast paced style. I think it fit the mood and theme of the novel by getting right down to the point yet without sacrificing any necessary description or much else. I felt that Anna's reactions were accurate, especially given what had happened to her.The supporting characters were very realistic and well portrayed as well. I enjoyed Anna's friends and liked how they were all different and presented as such. I also appreciated the family element thrown into this novel especially Anna's mother and father. They represented a different and realistic kind of family that I'm not so used to reading about.One of my favourite aspects of Wrecked was the brother/sister relationship between Jack and Anna. They aren't as close as they once were and given the accident and the fact that Cameron was Jack's girlfriend, things just become more complicated. The flashback scenes to when they were little kids were one of my favourite aspects of this novel. I love sibling development in books and so I greatly enjoyed the interaction between Jack and Anna, even the stifled conversation that takes place at first.Overall: I enjoyed this book a lot. If you're looking for a fast paced read with nice character development and you're interested in characters overcoming difficult aspects in their lives then this one is for you. I knew this book wasn't going to live up to the high expectations I had set when I saw the back when I read the "BEFORE" chapter. And when I finished the book, I was right.Not to say that this book was horrible--it wasn't. It was just... okay. I didn't have the urge to hurl it across the room and burn it to a crisp like I had wanted to after trying out Alice Sebold's The Almost Moon. But I didn't love it either. I wasn't amazed when I read the last sentence. I wasn't crying when I put it down. I just liked it. Plain and simple.You see, E.R. Frank is a good author. Not a great one, but I see where she's coming from. When Anna's sad or confused, you can feel the emotions there, but the thing is, Frank could have phrased things so much better. The writing is just so plain and doesn't require any thought, so things do get a bit boring sometimes. Also, Frank tends to ramble. There are certain parts of the book where the main character is having flashbacks. This could make for a very good unique style, but the flashbacks are dragged on for too long, and I often found myself not knowing if it was a flashback or something that was happening in the present. But despite its flaws, Wrecked was a good book. The premise was interesting, and I could relate to the sibling relationship between Anna and Jack. The book isn't phenomenal--it won't break your heart or move you to tears. But it's enough. And I will definitely be checking out some of E.R. Frank's other works in the future. Imagine re-living a bad memory that you want nothing from except to forget. Now imagine you can't do very much to forget about it. It wouldn't be very fun living like that would it? Nobody wants to remember, let alone re-live a terrible event that you have had to struggle through. You would try to forget about it,but it keeps coming back to haunt you, and there isn't much you can do about it. A life like that would not be a very enjoyable way to live. 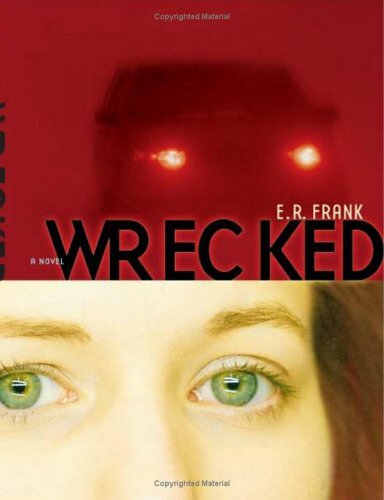 'Wrecked' by E.R Frank is a realistic fiction book that teaches the reader that no matter the situation, you can overcome your struggles and move on with your life.Anna wants to move past the horrible accident that killed her brothers girlfriend, but she keeps having reoccurring nightmares that bring the accident back up, so it's very hard for her to forget about it. An excerpt from the book that illustrates the theme of 'do what you want, not what others want', is, "if she wants to go, she'll go. "If you like this book, you may also like 'Life is Funny' by E.R Frank, because it's by the same author, and it was a top ten ALA 2001 quick pick. I would rate this book a 4 out of 5 stars because although it kept me interested for the majority of the book, there were a few flat spots that lost my attention and seemed to drag on. When I read the synopisis of Wrecked I immediately wanted to read this book! But I somehow did expect the main character to be a guy, I can't explain why.. I also expected this book to be in a letter format which it wasn´t.Wrecked is about Anna and Ellen who have a car accident after going to a party. In this accident the driver of the other car is killed - this happens to be Cameron, the girlfriend of Anna's brother.During the book Anna suffers from panic attacks and nightmares. She, Ellen and Jack all need to find a way to deal with what happened and to coninue with their lifes.I thought the characters in Wrecked felt very real, just as their emotions and their grief. I didn't like Anna's father, but I guess E.R. Frank wants me to feel that way.I didn't like the fact that Anna had been drinking the night of the accident. Even though Camera was in her lane and the accident wasn't Anna's fault I stil hated her for drinking and driving!other thing I didn´t like was the ending. It feels like there is no conclusion and the story feels unfinished. All in all I thought Wrecked was an OK read, the story was sad but didn't move me to tears. I liked the characters and the plot, but the ending felt unfinished. Anna finds herself in the most unfortunate position of having been on the other side of an accident which killed her brother’s girlfriend. And if that weren’t bad enough, her best friend Ellen was in the car with her, and suffered sever injuries. But while she was physically least scathed, Anna is the one who cannot readjust.She doesn’t know what to say to her brother. She doesn’t know how to get used to the way her mother is treating her. To her dad being somewhat less of a jerk. To her brother’s kind but distant treatment of her. Nightmares haunt her nightly. And the mere thought of driving sends her into such a panic attack that she’s sure she’s dying. And yet…she thinks she’s fine.At Thanksgiving, her Aunt insists she needs therapy. Though originally, against it, her father agrees to let her try. Though she doesn’t understand it at first, she’s also willing to give it a fair shot. Anything, if it means getting her life back again.This book takes a good look at the different ways people can be damaged by a tragedy, and the different ways people will choose to cope with that damage. For Anna, a good part of the healing process is simply letting go.